Means I have to buy this popcorn for my ankle-biters, and it’s difficult to say “No”. No wonder that watching movies is not the top activity for our family in the summer time, even though I would love to watch the latest Star Wars, or highly recommended by my friends Inside Out, or Australian made Oddball. 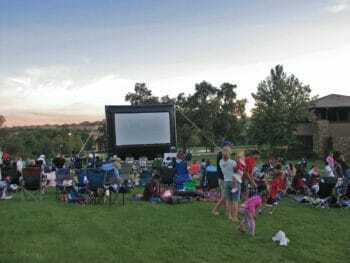 Yet, this summer I got hooked on outdoor movies – all thanks to the local enthusiasts organising movie nights in the parks of the city of Knox. The first outdoor movie event I attended was more of an excuse to stay outdoors and to skip cooking dinner. I also wanted to introduce my 5 y/o to the concept of going to the movies. We went there early, got our camping chairs and picnic rug out and had a snack. The Sun was going down, creating warm light around. The stems of the gumtrees were of the beautiful bright colours, and so was the evening sky. Children were playing on the green grass of the oval, running and doing cartwheels. Small local businesses were selling their goods, pet zoo was busy with little visitors, and teenagers were hanging around, with the young band granted access to the microphone to perform a couple of songs. Familiar faces of neighbours and kids from local schools made the evening feel like a good get-together party, relaxed and comfortable. Pre-movie activities were going on, with a big dinosaur puppet entertaining kids in front of the big movie screen. Kids had so much fun, and adults simply enjoyed watching them. It was getting dark and fresh – I was glad there was a coffee van with aromatic hot drinks! The movie started. The sound was powerful but not as uncomfortably loud as it can be in the movie theatre. The screen was big, but it was not filling all the viewing space – there were also the silhouettes of the tall gumtrees behind it, bright stars and a young crescent moon above it, and the darkness was not absolute. I have to admit – introducing the child to the movies did not work particularly well. Moreover, it was a disaster – she got scared, started crying and demanded to go home immediately. How lucky I was it did not happen in the movie theatre! It was easy to escape the movie grounds without disturbing other viewers, and, as I had not paid $50 for the tickets, I did not feel too frustrated. I have learned my lesson and since then I do not take my children to the movies just because the title sounds absolutely ok, like it was in the case with the Good Dinosaur, which proved to be too scary for a sensitive child. Going to outdoor movies is a bit like going on a quick camping trip. Pack camping chairs, sleeping bags, and torches. Get a picnic basket to eat outdoors. Spend the early hours of the night in the open air. Bonus for the comfort-lovers – after the movie, you do return back home to sleep in your own bed, while little kids are convinced they’ve been camping all night long. 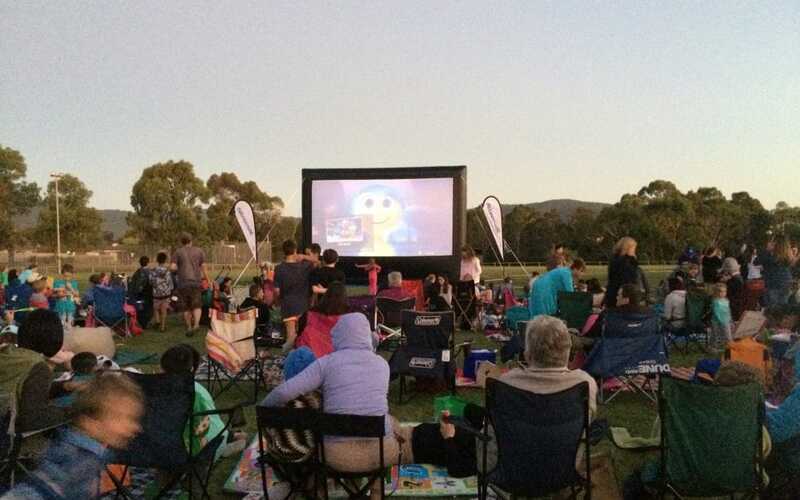 If you are lucky enough and your local council offers movies in the park close to your home, you can ride or walk there, without stressing about parking. Bonus: feeling that you are doing the right thing for your family. 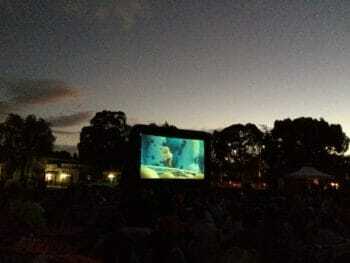 Outdoor movie events are often free or have minimal entry fee. It means affordable entertainment for the families; it also means local businesses can get an opportunity to generate revenue and get a good brand exposure, while we are spending money on them and not on tickets to Hoyts. Outdoor cinema is both kids and pets friendly. It gives the feeling of freedom – to sit, stand, and walk or even to crawl around (if you are a fidgety toddler) whenever you feel like it. One does not feel guilty or uncomfortable leaving half through the movie – everybody understands. Watching movies in the open air is so much more romantic than going to the cinema. While event organisers create the general atmosphere of joy and excitement before the movie, Mother Nature takes care of us, creating beautiful backdrop and unforgettable experience, no matter the weather. Have you been to an outdoor cinema this summer? We would love to hear your story!